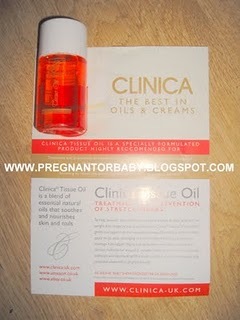 Clinica tissue oil is a unique blend of oils which soothe and nourish skin and nails. With regular use and the correct massage procedure Clinica® tissue oil helps return elasticity to sagging and wrinkled skin. The result would be an appearance of a toned and firmer skin. To help prevent stretch marks which are caused by rapid change in body size, such as weight loss, pregnancy and adolescence, Clinica® tissue oil should be gently massaged into the areas most susceptible to stretch marks. For stretch marks that already exist, apply twice daily massaging gently in circular motions into the affected area. During pregnancy massage hips, upper thighs, and abdomen twice daily from early in the first and second trimesters. Apply Clinica® tissue oil over the area and massage in gentle circular motions for ± 5 minutes. Work from the navel upwards, sideways and downwards. This tones the muscles, and in combination with antenatal and post natal exercises are of great benefit. The smell of the oil is so easy on the senses. In fact, it’s a rather lovely light fragrance and one that I think makes for a nice perfume alternative, if you’re feeling sensitive. This is down to the ingredients - Clinica Tissue Oil uses mainly essential oils. These include mineral oil, sweet almond oil, evening primrose oil and coconut oil. As well as a pregnancy oil, Clinica oil can also be used on children... steps up K, we are very lucky that touch wood K has had no apparent skin issue but putting a tiny bit in his bath allows his skin an extra little bit of moisture and we all know how little boys play... basically getting as grubby as possible until mummy runs around after them with the pack of baby wipes so every little helps! I like the fact it has many uses and that it is a product that the whole family can use. Andrew my fiance suffers from sore legs and this leaves him with darker parts to his skin where it has rubbed, he has also been using the oil although not when sore when healed to help the discolouration of his skin whether this actually helps or not I couldn't comment but he seems to think that it does.